Near Çemberlitas Square in Istanbul, a stone’s throw away from the Grand Bazaar, stands the ethereal Çemberlitas hammam, built in 1584. 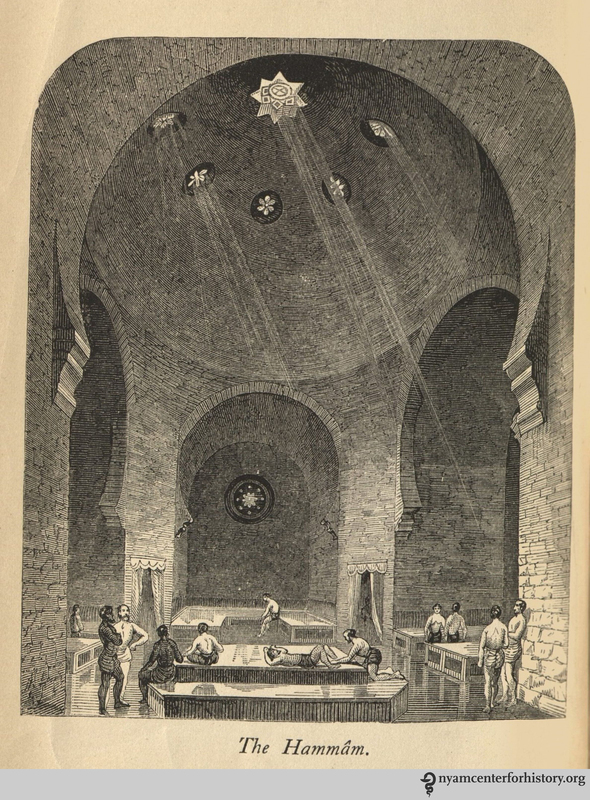 At first glance, one might think the frontispiece of David Urquhart’s Manual of the Turkish Bath depicts this famous Turkish bath, with its domed vaults and cut-away star windows in the ceiling. The Hammam. In: Urquhart, Manual of the Turkish Bath, 1865. It does not. Instead, the engraving depicts a proposed new construction in 19th-century London. By the 1870s, these baths, modeled on Turkish hammams, were scattered across England and America, largely through the efforts of Scotsman David Urquhart. In the mid-19th century, Urquhart, an antiquarian and diplomat who had travelled widely in Spain, Morocco, and Turkey, ignited a wave of enthusiasm for public baths in Britain. He wrote about the dry hot-air bath, or hammam, he visited in Turkey in his travelogue, The Pillars of Hercules. The Riverside bath was comprised of a hot room, built directly over the part of the floor with the hottest air underneath (240-250 F); followed by a second hot room, kept at 170F; and, down a set of marble steps, a third area with a divan, kept at 150F. Soft pillows were available for comfortable reclining in each space. The Bath at Riverside. In Wilson, The Eastern or Turkish Bath, 1861. After this scrub-down, Wilson visited the piscina, a square pool, for a cold water plunge. Wilson explains that typically this might be followed by a second washing, a warm Turkish towel, and a period of relaxation. 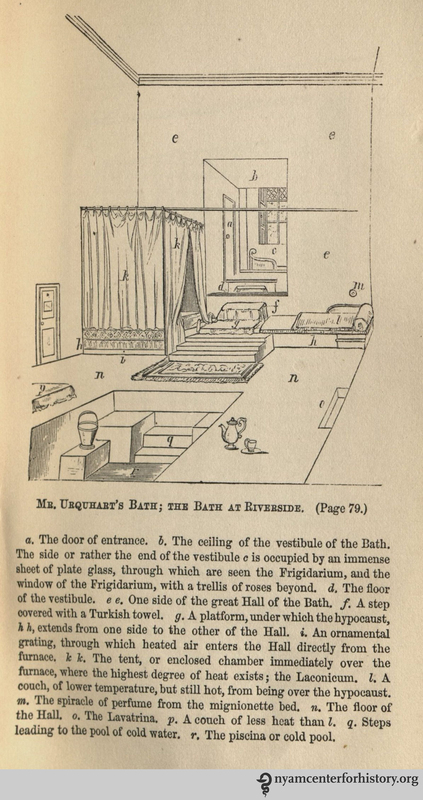 In 1862, Urquhart supervised the construction of another London bath at 76 Jermyn Street (the hammam depicted in the first image of this post). After several decades of popularity with Londoners it closed because of disuse. A bomb destroyed the facility in April 1941. Section of the Hammam, Jermyn Street. In Urquhart, Manual of the Turkish Bath, 1865. 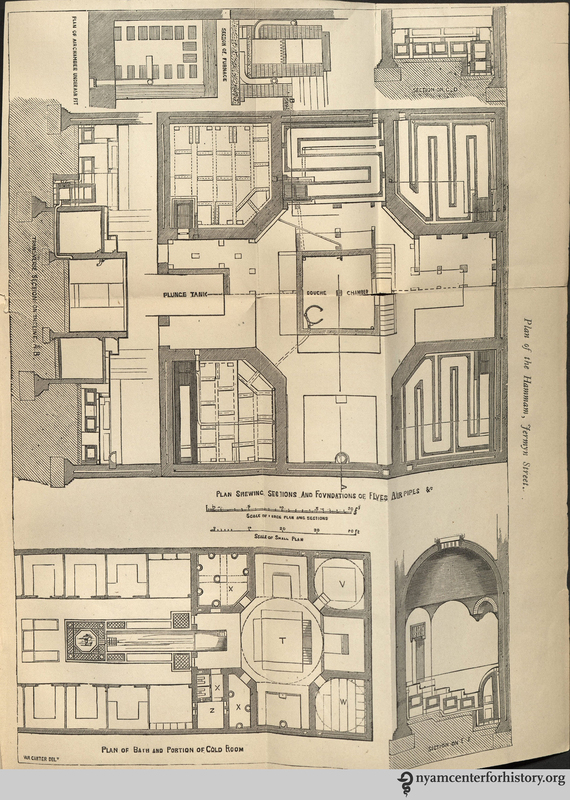 Plan of the Hammam, Jermyn Street. In Urquhart, Manual of the Turkish Bath, 1865. April 16th—Twenty-first week of Bath treatment; has had about fifty baths in all. Is now in all respects going on well. Sleeps well, and has no night-sweats; appetite good; bowels regular; cough almost gone. Has worked ten hours a day for last two months, except on days when he takes a bath. 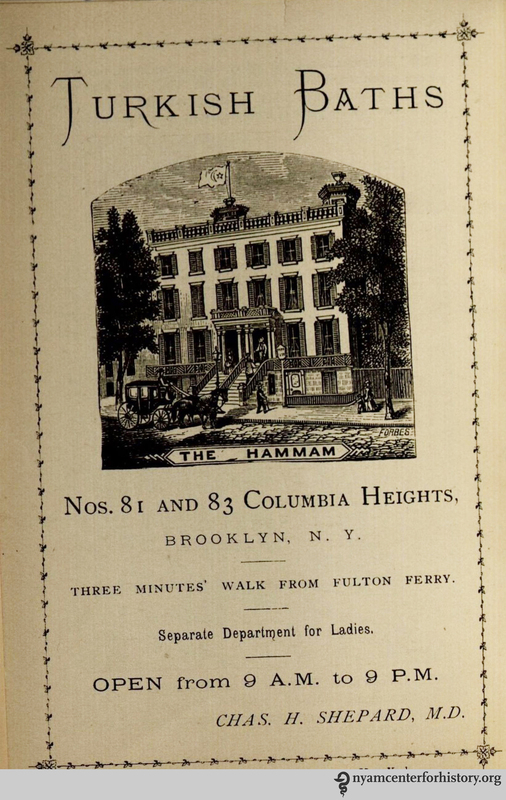 By the 1860s, Urquhart’s new Turkish bath had caught the notice of the Brooklyn physician Dr. Charles Shepard. Shepard’s 1873 pamphlet praised Urquhart’s revival of the bath, and promoted a new bath established by Shepard in Brooklyn Heights. 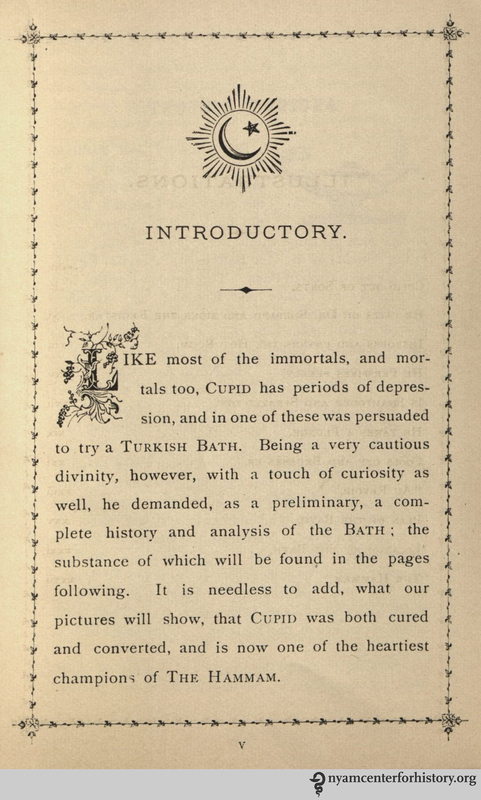 Introduction to Shepard, The Turkish Bath, 1873. Cupid out of sorts–is advised to take a Turkish Bath. In Shepard, The Turkish Bath, 1873. “He calls on Dr. Shepard and signs the register.” In Shepard, The Turkish Bath, 1873. “He disrobes and enters the Hot Room.” In Shepard, The Turkish Bath, 1873. “He takes leave of the Doctor as gay as a lark. ‘Au Revoir. '” In Shepard, The Turkish Bath, 1873. 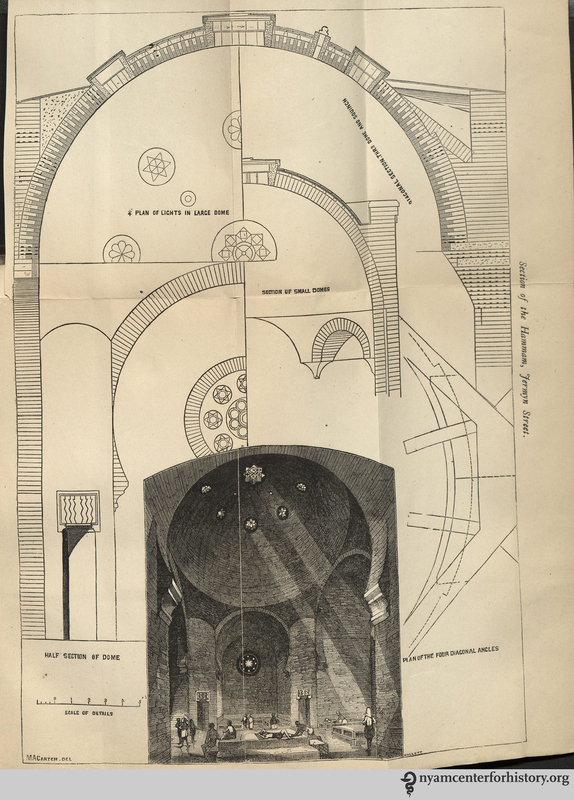 The pamphlet includes Shepard’s plan for his Brooklyn Heights bath. New Yorkers were encouraged to visit 9am to 9 pm, all days of the week except for Sundays. It remained open until 1913. 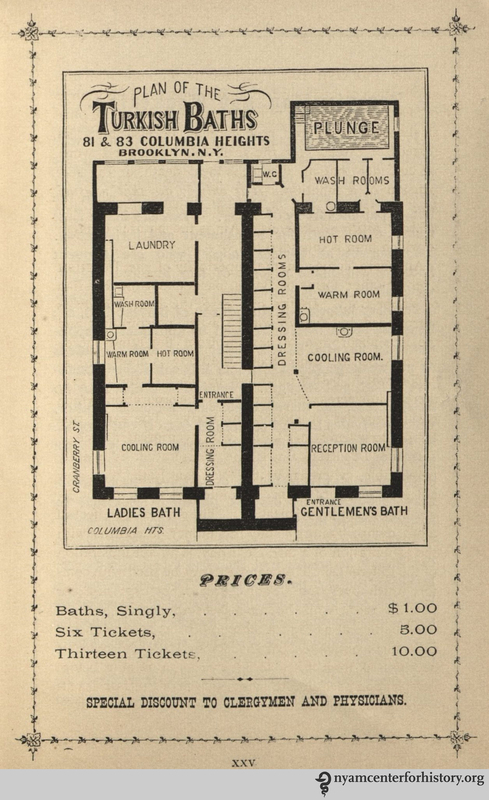 Plan and prices of the Turkish Baths in Brooklyn Heights. In Shepard, The Turkish Bath, 1873. 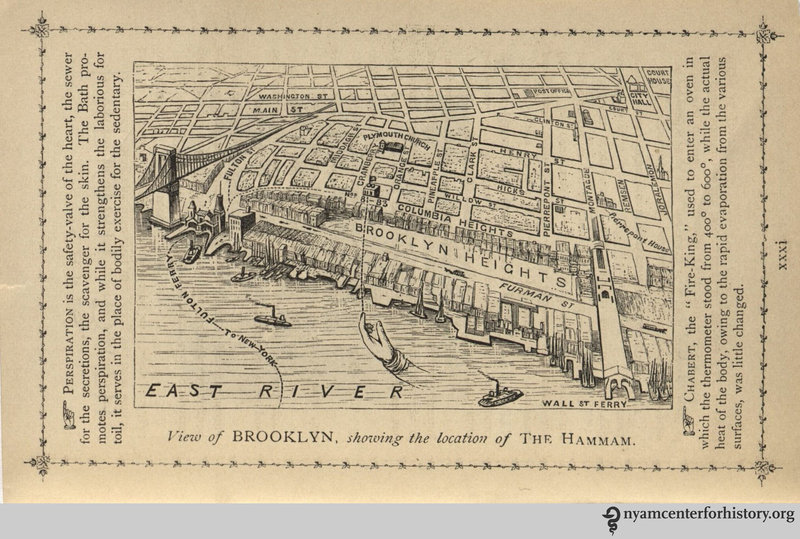 View of Brooklyn, showing the location of the Hammam. In Shepard, The Turkish Bath, 1873. Click to enlarge. The Bath’s exterior. In Shepard, The Turkish Bath, 1873. 1. This was the Hydropathic Establishment of St. Anne’s in Cork. In many parts of Europe today, the “Turkish bath” is known as the “Irish-Roman bath.” See victorianturkishbath.org. 2. Urquhart, David. Manual of the Turkish Bath. John Fife (Ed.). London: John Churchill & Sons, 1865. 3. Wilson, Erasmus. The Eastern, or Turkish Bath: Its History, Revival in Britain, and Application to the Purposes of Health. London: John Churchill, 1861. 5. Shepard, Charles H. The Turkish Bath. Brooklyn, NY: S.W. Green, 1873. P.30. This entry was posted in Collections, History of medicine and tagged 19th-century medicine, balneology, bathing, Charles Shepard, David Urquhart, hammam, Turkish baths by nyamhistorymed. Bookmark the permalink. May I make just a couple of comments on your excellent blog. When writing about the Jermyn Street Hammam you say ‘After several decades of popularity with Londoners it closed because of disuse.’ and while this is literally correct I don’t think it gives a clear picture of what actually happened. The letter sent to the shareholders of the London & Provincial Turkish Baths Co Ltd on 13 December 1940 gives a clearer view of what happened. Referring to the London Blitz, it writes, ‘The bombing which started in September last soon had a serious effect on the Company’s business and it was apparent that unless enemy action ceased, Trading could only be carried on at a loss.’ It was a wise judgment as the destruction of the baths a few months later was responsible for a number of deaths and injuries in neighbouring buildings, but none in the baths which were then empty. Most cinemas and theatres in London closed during this period except the Windmill revue theatre (popular with the armed forces on leave) which famously had as its slogan ‘We never closed’, until it was finally converted into a cinema in 1964. The other point relates to Shepard’s baths on Brooklyn Heights. When you write that his 1873 booklet ‘promoted a new bath’ it seems to imply that this is when the baths opened, but they actually opened as early as the beginning of October 1863, but there were a number of refurbishments and enlargements throughout the life of these baths and the booklet may have been referring to one of these as his ‘new’ baths. After decades of neglects by historians it is a real pleasure to come across such a delightful blog. Thank you. Perhaps I should have added to my original comment that there are two illustrated articles at http://tinyurl.com/jdae2u5 which give further information about the first two Victorian Turkish baths in the United States. These are the one mentioned in your blog at Columbia Heights in Brooklyn, and the other was the first to open in Manhattan, at Laight Street in March 1865.